It's been a while since I uploaded a video - I wish I had more time to make these! In our Projects of the Month from October, I included one on how to model the famous T-Square fractal. This prompted architect and professor Nicolai Steinø of Denmark's Aalborg University to share with me his method of creating this model. The beauty of SketchUp components is how easy it is to change one to get a whole new look to your model. For the first time, I'm offering something by another author on my website! Written for SketchUp Pro and LayOut users, this PDF book is a tutorial on creating construction documents, and costs only $18.95. 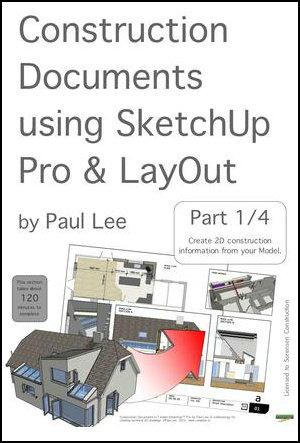 The author is my friend and colleague Paul Lee who runs Viewsion - Ireland's first authorized SketchUp training center. Paul has been around the SketchUp "scene" for several years, and has developed a nice, streamlined method for taking SketchUp models and getting them ready for presentation in LayOut. His method was featured recently on SketchUp's Official Blog. View some sample pages here. The entire book is estimated to take 4-6 hours to go through, depending on how many coffee breaks you take. All starter models are ready-made and waiting for you to download. One of this month's projects shows how to model a working sundial, and another one shows how to animate the shadows moving over the hour markers. 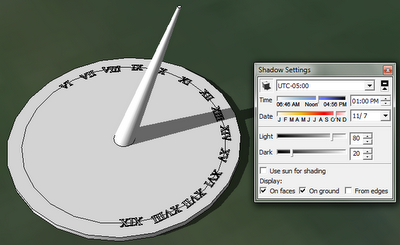 Here's the animation I made of my sundial, from 6 AM in the summer to 7 PM. This was a really fun project! These projects are going out tomorrow to subscribers, and the year of projects is on sale for just $24.95. While the Amazon page for our new Interior Design textbook still doesn't have a "Look Inside" feature (I hear that's in the works), you CAN see a book preview on the Pearson site itself. Go to this page on the Pearson site, and click the "Take a closer look" link on the set of tabs halfway down the page. That opens a presentation in which you can see the Table of Contents and the entire first chapter. The charette model featured a "human sundial," which I didn't reproduce with an actual human, but instead modeled a more traditional, working sundial which tells the hour based on shadows. 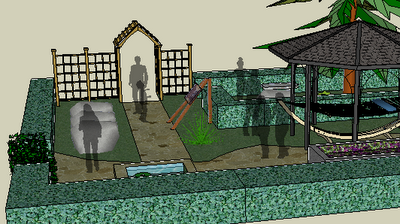 You need to tell SketchUp where on Earth the sundial is located, then let SketchUp figure out the shadows. Once you have your sundial, this project shows how to save scenes you can use to see its shadow based on the hour and season. The people and trees in the classroom model from the charette are translucent silhouettes - a nice, artistic way to show entourage in a model. This project shows how to populate a model with silhouettes of poeple, and how to make them translucent. To get these cool projects, and 33 more over the next 12 months, subscribe to our Projects of the Month.